It’s not often I choose to wear a maxi dress. 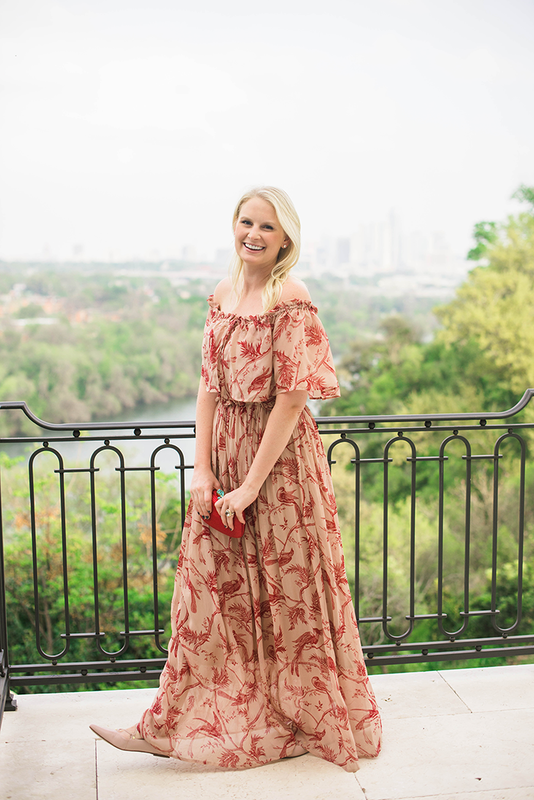 While I love the casual-glam vibes maxi dresses can exude, they usually don’t do my figure any favors. As a somewhat curvy, tall gal, it’s not always the most flattering silhouette for my body. It’s really gotta have the right waist-cinching super powers, and in this case, a little off-the-shoulder action, to attract my attention. Take a page out of Stella McCartney’s book with this vivid yellow pleated maxi. PS – this mimic is under $100! This lace number comes in three sizzling summer shades and features a bit of a plunging neckline. This lavender floral maxi is soft, feminine and very romantic. Gorgeous! Bring the heat in this bright orange off-the-shoulder dress. Add to cart. For a more glamorous look, try this pale pink strapless dress with a double layer-ruffle up top. what a stunning dress, you look fabulous. I love this maxi! I’ve never worn one to a wedding yet, but I think I might change that this year. So comfy and fun! Great pictures. I just love this dress and the print. I thought those halogen flats were Aquazzura. Love this boho chic look on you! So pretty! I think you can carry off the maxi dress because you’re tall (I’m only 5″4 so sadly I cannot). I’m also loving the off the shoulder style. I definitely need to invest in this trend for spring! I love this frock. It looks stunning on you. Perfect for a wedding. PS – I included your lash tutorial article in my weekly round up of must-read articles. I love this maxi on you!! Those colors are beautiful! Definitely wedding appropriate. Such a romantic print and style. Gorgeos look! This piece is the perfect maxi for you.